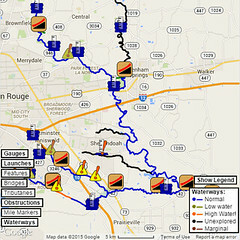 With the Comite up, I decided it was time for another Comite/Amite run from Hooper Road to Port Vincent. I quite enjoy the route (when the Comite is navigable), and it had been a while since the last time I ran it. I certainly recalled the quantity of litter that I was going to find along the way, so I decided at the outset that I would narrow my general cleanup plans and instead spend the day on a theme. What theme should I choose? Well, the last time I made the run with Mike, we had a running tally going for several miles regarding the number of balls we saw on the water. It started off as a simple diversion, and gradually it became a running gag, but eventually it became a sorry commentary on the litter problem. So, remembering that, I decided that my theme for the day would be that: balls. I put it behind Blackwater Conservation Area off Hooper Road. It’s about half a mile along the trails from the parking lot to the Comite, but with my little canoe dolly, it’s a walk in the park. (Sorry, couldn’t help myself.) With the Comite up as it was, I was averaging five miles an hour on the run downstream, so I figured it would be no time at all until I found my first ball. It was over *four miles*. I was over seven miles in before I found my fifth ball. At that point, I was seriously starting to wonder whether I’d made a poor choice. Perhaps there *weren’t* as many balls out there as I’d thought. Had they all been flushed away by the high water? The next mile and a half, however, provided fifteen more balls, so I started to feel a bit less foolish. By the time the Comite hit Florida Boulevard and the Amite, I was up to a respectable 51 balls. (That’s, what, about five balls per mile?) I stopped for a moment there to rearrange everything, stuffing partially-deflated balls under the seats and wherever else they would fit, as I had a feeling I was going to find many more shortly. 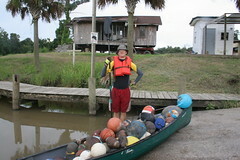 The next two miles added *seventy* more balls to my canoe, and by the time I crossed I-12, my total was right around 130. That’s a lot of balls, in case you weren’t completely clear. 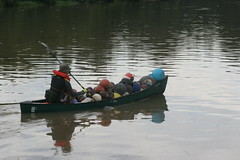 Most of them were floating among the various litter rafts that collect at downed trees and other obstructions. 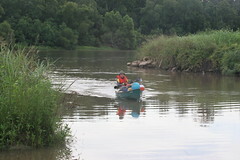 Reaching them often involved working the canoe onto or through huge areas of flotsam, but reach them I did. The next five and a half miles were not nearly so productive, with many of the balls found solo or in small bunches, but I was up around 160 and starting to feel a bit pressed for space in my canoe. 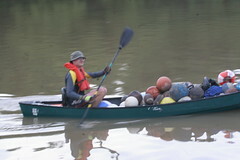 A couple miles worth of ball-drought wasn’t a terrible thing at that point, but then I hit a huge litter raft. I kept picking until I reached 175, but it turned out that was pretty much my limit. 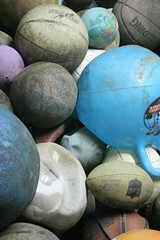 I had nowhere left to put more balls, and any more would just roll off the pile and back into the water. I decided to call it a full load. At that point I was about 23.3 miles into my run. What I hadn’t thought of prior to the run was exactly how much more strenuous that was than a normal run. As my body began protesting in earnest, it occurred to me that every time I saw a ball, I had to stop my downcurrent momentum, turn around, and paddle up to wherever the ball was. Then once I had the ball (or had worked over a litter raft to collect multiple), I had to push off, turn around, and start myself back downstream. Turns out, that’s a *LOT* of additional work, go figure. I was *beat*. It’s time’s like these it’s nice to have friends. I called one up and asked for an earlier-than-I’d-planned pickup, changing my intended exit to Big John’s Galveztown Landing (instead of Fred’s at Port Vincent). 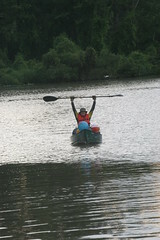 He accepted my request and about 11 miles after my last ball, I was coming around the bend just beyond Bayou Manchac. He was even kind enough to take some photos of my approach.